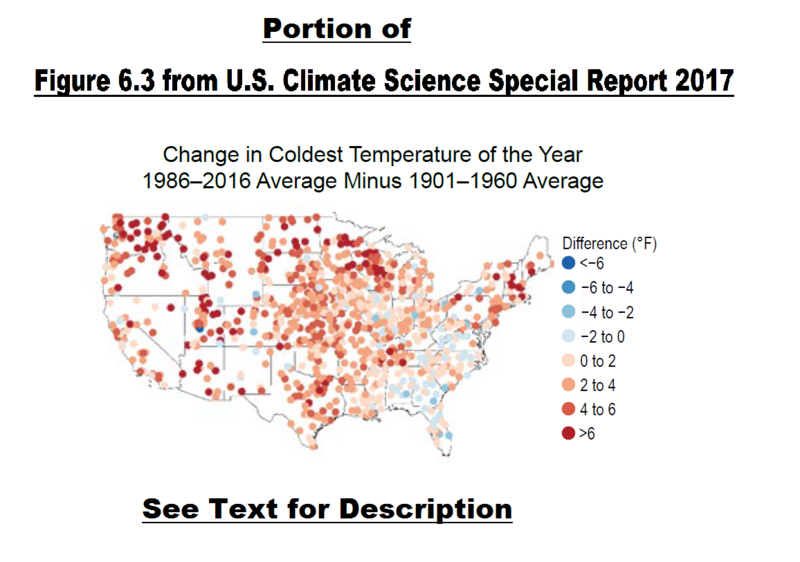 Observed changes in the coldest and warmest daily temperatures (°F) of the year in the contiguous United States. Maps (top) depict changes at stations; changes are the difference between the average for present-day (1986–2016) and the average for the first half of the last century (1901–1960). 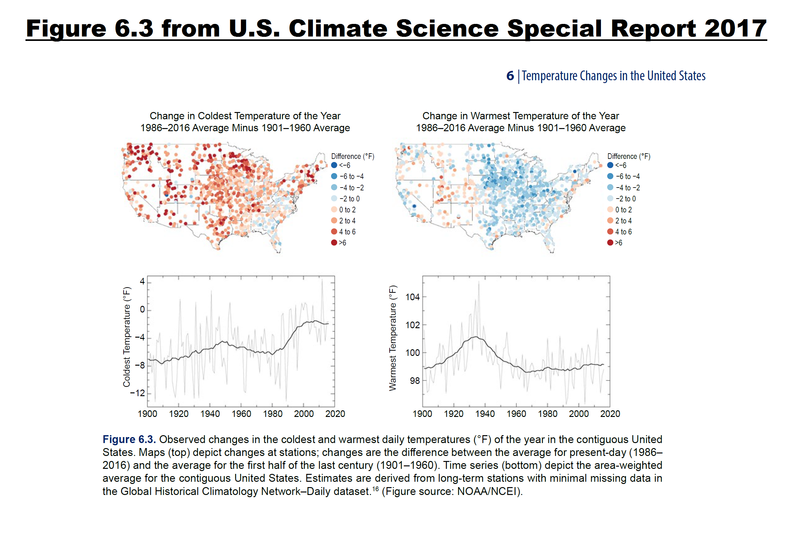 Time series (bottom) depict the area-weighted average for the contiguous United States. Estimates are derived from long-term stations with minimal missing data in the Global Historical Climatology Network–Daily dataset.16 (Figure source: NOAA/NCEI). For those having trouble reading the graphs and maps, see the individual cells below. 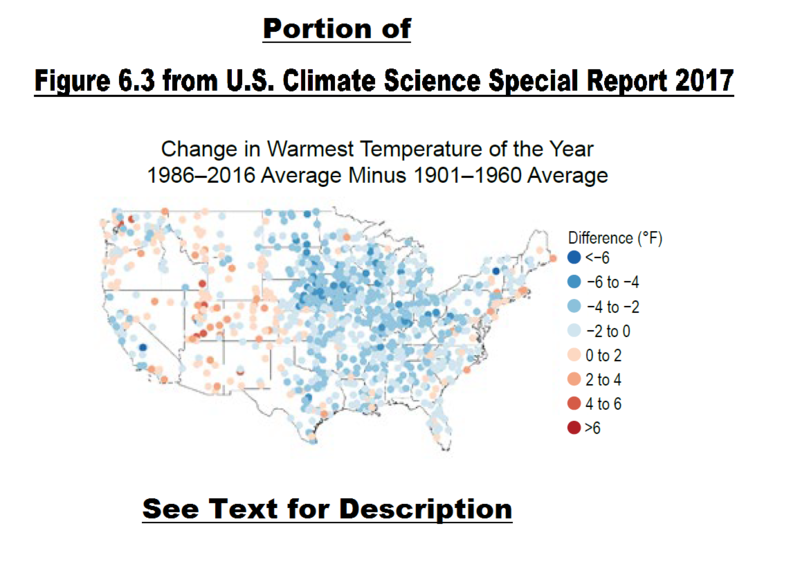 Observed changes in cold and heat waves in the contiguous United States. The top panel depicts changes in the frequency of cold waves; the middle panel depicts changes in the frequency of heat waves; and the bottom panel depicts changes in the intensity of heat waves. Cold and heat wave frequency indices are defined in Zhang et al.,15 and the heat wave intensity index is defined in Russo et al.14 Estimates are derived from long-term stations with minimal missing data in the Global Historical Climatology Network–Daily dataset.16 (Figure source: NOAA/NCEI). Shifts in temperature extremes are examined using a suite of societally relevant climate change indices14 ,15 derived from long-term observations of daily surface temperature.16 The coldest and warmest temperatures of the year are of particular relevance given their widespread use in engineering, agricultural, and other sectoral applications (for example, extreme annual design conditions by the American Society of Heating, Refrigeration, and Air Conditioning; plant hardiness zones by the U.S. Department of Agriculture). Cold waves and heat waves (that is, extended periods of below or above normal temperature) are likewise of great importance because of their numerous societal and environmental impacts, which span from human health to plant and animal phenology. Changes are considered for a spectrum of event frequencies and intensities, ranging from the typical annual extreme to the 1-in-10 year event (an extreme that only has a 10% chance of occurrence in any given year). The discussion focuses on the contiguous United States; Alaska, Hawai‘i, and the Caribbean do not have a sufficient number of long-term stations for a century-scale analysis. Changes in the occurrence of record-setting daily temperatures are also apparent. 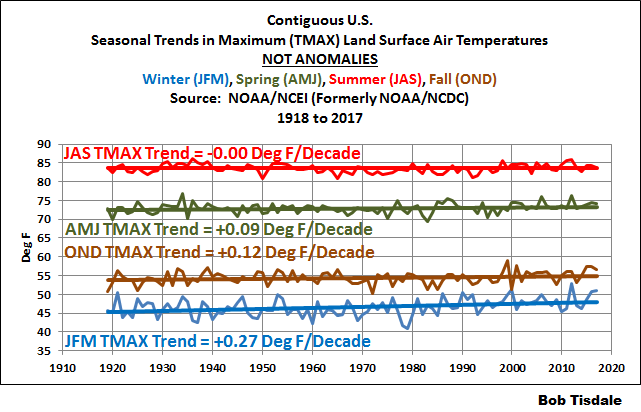 Very generally, the number of record lows has been declining since the late-1970s while the number of record highs has been rising.23 By extension, there has been an increase in the ratio of the number of record highs to record lows (Figure 6.5). 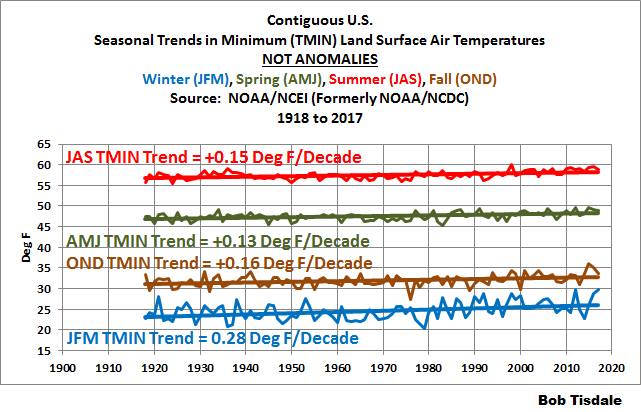 Over the past two decades, the average of this ratio exceeds two (meaning that twice as many high-temperature records have been set as low-temperature records). The number of new highs has surpassed the number of new lows in 15 of the last 20 years, with 2012 and 2016 being particularly extreme (ratios of seven and five, respectively). 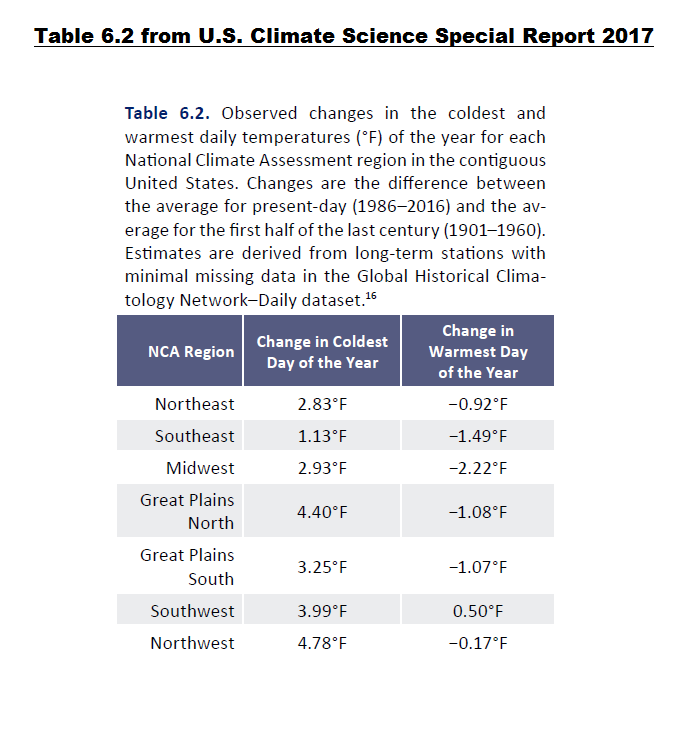 Observed changes in the occurrence of record-setting daily temperatures in the contiguous United States. 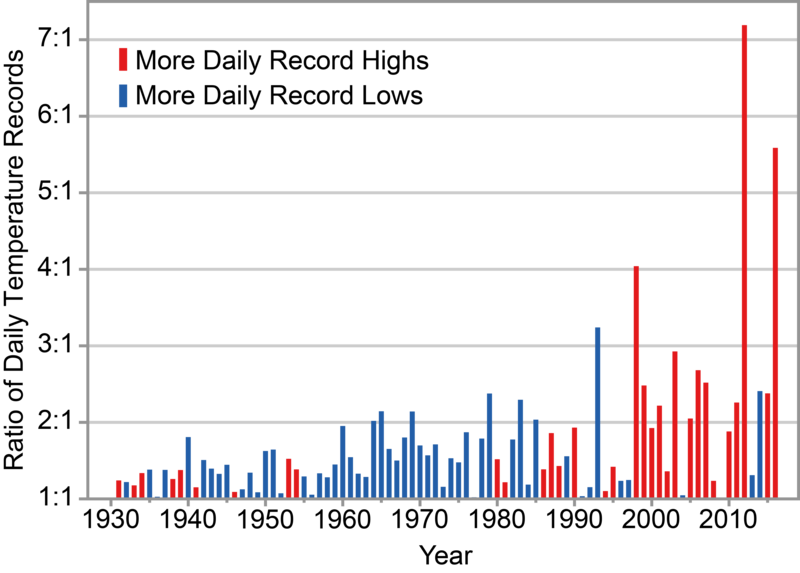 Red bars indicate a year with more daily record highs than daily record lows, while blue bars indicate a year with more record lows than highs. The height of the bar indicates the ratio of record highs to lows (red) or of record lows to highs (blue). For example, a ratio of 2:1 for a blue bar means that there were twice as many record daily lows as daily record highs that year. 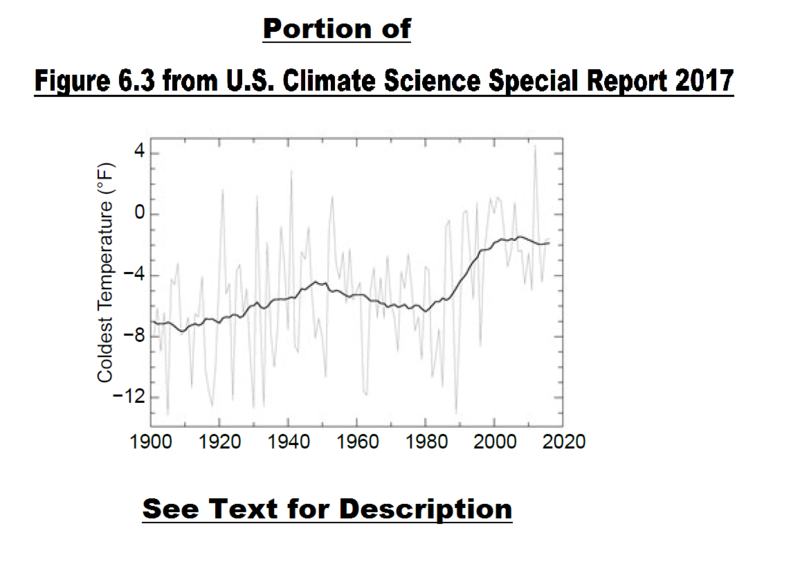 Estimates are derived from long-term stations with minimal missing data in the Global Historical Climatology Network–Daily dataset.16 (Figure source: NOAA/NCEI). That graph is so silly it’s laughable. After they present something as nonsensical as that, do they expect us to take the rest of the report seriously? Of course, those daily record highs and lows happened throughout the year. What they aren’t telling us is that the recent record highs likely occurred least often during the summer months and that they likely occurred most often during winter months. I’ll let you comment on that nonsense. That’s it for now.